AWS customers are making great use of Amazon DynamoDB. They love the speed and flexibility and build Ad Tech (reference architecture), Gaming (reference architecture), IoT (reference architecture), and other applications that take advantage of the consistent, single-digit millisecond latency. They also love the fact that DynamoDB is a managed, serverless database that scales to handle millions of requests per second to tables that are many terabytes in size. Many DynamoDB users store data that has a limited useful life or is accessed less frequently over time. Some of them track recent logins, trial subscriptions, or application metrics. Others store data that is subject to regulatory or contractual limitations on how long it can be stored. Until now, these customers implemented their own time-based data management. At scale, this sometimes meant that they ran a couple of Amazon Elastic Compute Cloud (EC2) instances that did nothing more than scan DynamoDB items, check date attributes, and issue delete requests for items that were no longer needed. This added cost and complexity to their application. In order to streamline this popular and important use case, we are launching a new Time to Live (TTL) feature today. You can enable this feature on a table-by-table basis, specifying an item attribute that contains the expiration time for the item. Once the attribute has been specified and TTL management has been enabled (a single API call takes care of both operations), DynamoDB will find and delete items that have expired. This processing takes place automatically and in the background and does not affect read or write traffic to the table. You can use DynamoDB streams (see Sneak Preview – DynamoDB Streams for more info) to process or archive the actual deletions. Like other update records in a stream, the deletions are available on a rolling 24-hour basis. You can move the expired items to cold storage, log them, or update other tables using AWS Lambda and DynamoDB Triggers. The attribute must be in DynamoDB’s Number data type, and is interpreted as seconds per the Unix Epoch time system. 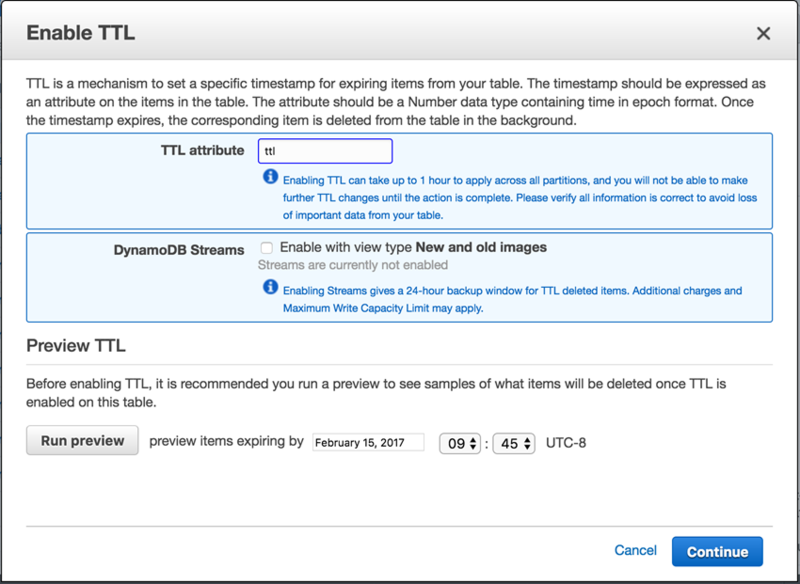 As you can see from the screen shot above, you can also enable DynamoDB Streams, and you can look at a preview of the items that will be deleted when you enable TTL. You can also call the UpdateTimeToLive function from your code, or you can use the update-time-to-live command from the AWS Command Line Interface (CLI). With HTTP/2 in every browser, load balancing with automatic failover, IPv6, a sorry page, separate blog server, HTML5 SSE and A+ HTTPS. For speed! One of the pages on our blog loads in 1.9s on HTTP 1.1. The same page loads in 600ms over HTTP/2. If you’re working on IoT devices, which often require IPv6. Load balancing between multiple app servers with automatic failover. So you can upgrade your app without taking it offline. Just in case you break both the app servers at the same time. So you can keep your blog independent of the main app and update it on its own schedule. Correct proxy headers for working GeoIP and logging. So your app servers can see the proper origin of browser requests, despite the proxy. Because asking customers for their country when you already know is a waste of their time. So the users can connect privately to your site. The various www vs non-www, HTTP vs HTTPS combinations redirected to a single HTTPS site. This ensures there’s only one, secure copy copy of every resource for both clarity and SEO purposes. Introduction of RecyclerView is the best thing ever happen to android world. You can create stunningly beautiful lists and grids using the RecyclerView. Lot of us are very familiar in rendering the basic lists when the UI is very simple. But it comes to more complex lists that contains multiple UI elements along with animations, not everybody can achieve the final output they are looking for. This article aims to improvise your knowledge on RecyclerView by taking an example of Gmail style inbox that contains the complex list design with interactive animations. The desired output like Gmail app can’t be achieved just with the RecyclerView alone. It needs combination of other few android concepts. Overall we gonna use the below mentioned components to get the finest appearance and functionality. The basic component required for this app is RecyclerView as our primary task is to display the data in list fashion. The appearance of the list is customized just like Gmail app displaying a thumbnail icon, three line message, timestamp and a star icon to mark the message as important. In order to refresh the inbox, SwipeRefreshLayout is wrapped around the RecyclerView. This article doesn’t explains the persistence of the data. So the inbox will be reset to initial state up on refresh. ActionMode is used to display the contextual toolbar when a row is long pressed in the list. This enables us to provide set of alternative toolbar icons when the recycler view is in multiple choice mode. Here we provide delete option to delete the selected messages. Object Animators allows us to animate a target element. In this we use the object animators to perform the Flip Animation of list thumbnail icon when a row is long pressed. In a production app, all the inbox messages are dynamic i.e they are fetched from a REST API. To demonstrate that, I have used a JSON url to list the messages. We use Retrofit library to fetch and deserialize the JSON. Today, 10 years after of SHA-1 was first introduced, we are announcing the first practical technique for generating a collision. This represents the culmination of two years of research that sprung from a collaboration between the CWI Institute in Amsterdam and Google. We’ve summarized how we went about generating a collision below. As a proof of the attack, we are releasing two PDFs that have identical SHA-1 hashes but different content. This post is the first in a four-part series that will dive into developing applications in a serverless way. These insights are derived from several years working with hundreds of developers while they built and operated serverless applications and functions.